The long-awaited iPhone has failed to match the hype with sales of Apple’s ground breaking gadget falling short of expectations. Mobile network giant O2, which is the only network provider in the UK for the handset, sold 190,000 for the first eight weeks from the iPhone’s launch in November - 10,000 short of the figures it predicted, according to the Financial Times. 02 had anticipated selling 200,000 iPhones in the first two months, but analysts predicted the sales would be far higher after pre-launch hype led to expectations that the £269 phone would quickly become a best seller like its iconic iPod predecessors. But the high price tag and restrictions on using the phone on just a single network is thought to have put many consumers off buying the ground-breaking touch sensitive mobile phone. Customers buying the phone were required to take out an 18 month contract at £35 a month, facing an outlay of £899. Apple also released software updates in a bid to prevent people from having their iPhones "chipped", which allowed them to use the phone on other networks. O2 has insisted that the iPhone has attracted "unprecedented levels of customer satisfaction" and said the iPhone was its fastest ever selling handset. It also said that the device had triggered a three-fold increase in the number of people visiting its stores in the past two months. Consumer technology analysts Gartner, however, had predicted in November that sales of the iPhone could reach up to 400,000 in the first two months. The first weekend of iPhone sales sparked fears that uptake would be disappointing after UK stores failed to attract the long queues seen outside retailers in the United States when the phone was launched there earlier in the summer. Apple chief Steve Jobs this week revealed that the company has sold more than 4 million iPhones worldwide - an average of 20,000 iPhones a day. Speaking at Apple’s technology showcase MacWorld Expo, he also announced new software, including an upgraded location detection feature, in a bid to attract more customers. 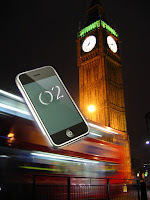 Apple and O2 have both declined to comment on iPhone sales figures in the UK. The O2 figures come as Carphone Warehouse, which has also been selling the iPhone in its stores, reported disappointing sales figures over the Christmas period. It reported an 11 per cent rise in connections of all mobile phones compared to the anticipated 15 per cent.